The figure of the 'troubled artist' — whose immense creativity and charisma are accompanied by a reckless, self-destructive lifestyle that ends in a premature demise — looms large on the pop cultural landscape. From Jackson Pollack and Jim Morrison to River Phoenix and Kurt Cobain, the tragedy has played itself out so many times that it has become, at best, a cliché; at worst, a pattern to be emulated by those who deign to follow in their heroes' footsteps. The stereotype is cemented when these figures' stories are transposed onto cinema screens. Ed Harris channelled Pollack for the eponymous film version. Val Kilmer immortalised Morrison in Oliver Stone's The Doors. And Cobain's final hours were re-imagined by filmmaker Gus Van Sant and his star, Michael Pitt, in Last Days. But while such films make compelling viewing, offering insight into their subjects' complex personas and recreating their fate with emotional punch, the question remains whether there is anything to be gained by perpetuating the 'troubled artist' cliché. At what point does tribute to the person's memory and achievements become a celebration of their self destruction? It's a fine line to tread. 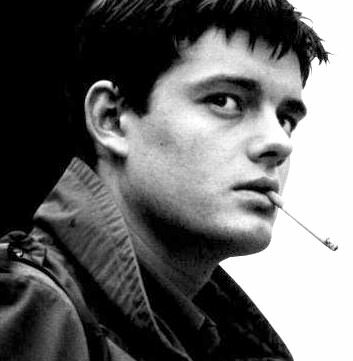 In his feature directorial debut Control, internationally renowned photographer Anton Corbijn brings a sense of gentle lyricism and brooding understatement to the final years of Joy Division front man Ian Curtis' life. Curtis (played with simmering intensity by Riley) married very young, and was on the brink of international superstardom when he committed suicide at the age of 23. Control portrays him as a troubled youth overwhelmed by the contrasting responsibilities of his music career and his domestic life. Curtis' improperly medicated epilepsy adds to the burden, but ultimately it's an affair with a European journalist that proves to be his emotional and psychological undoing. The fact the film draws upon the memoir of Deborah, Curtis' widow, and credits Manchester rock'n'roll guru Tony Wilson (who 'discovered' Joy Division) as a co-producer, lends it a sense of authenticity. Unsurprisingly, given Control's source material, it is Deborah (Morton) who arises as the great victim of Curtis' self destruction — left to emerge alone, with their still infant daughter in her arms, from the mire of her husband's self-serving tragedy. Which suggests that ultimately, the thing that prevents the 'troubled artist' biopic from too enthusiastically venerating its antihero is the weight of sympathy it allocates to the others in the artist's life — the true victims, who are left bruised and bleeding in their loved one's wake. Their child was a girl, Natalie. Brilliant review otherwise. David - 'Their child was a girl'...oops, right you are! I have corrected the error. Thanks for pointing it out. And, glad you liked the review! Cheers. I found this article to be informative but towards the end became too judgmental IMHO. Use of the term 'true victims' is disingenuous. As a fellow depressive believe me, I know that the 'true victim' is the sufferer. Those left behind will suffer the usual grief associated with losing a loved one but they were always destined to suffer that when they lose parents friends relatives as a natural consequence of living. Depression is however unnatural. To be afflicted by the unnatural in life is worse that to suffer what is part of the natural cycle of life (bereavement). That's why Ian's words and even his dancing is unnatural. i love joy divison ... i only wish i was old enough 2 b able 2 c them play. but i listen 2 them every day, i cant get my day started with them. i actually listen 2 them on vinyl, im luck n that way. i just wish i had more. all i can say is what a waste of a great band. i also suffer from sezures. its scary and controls ur life. so i understand a Ians troubles about that. but actually i get a lot of courage from him, strange i know. anyway thank you. For Richard Dawkins, excitement about the visible world leads only to analytical questions. The task of those who oppose this view is to describe the richness of the alternative.